We were blown away last year when our Periodic Table of Pharma Multi-channel Marketing turned into a runaway success with around 15,000 views across Medium, LinkedIn and Slideshare. So, new for 2018 we’ve created The Periodic Table of Healthcare Communications which builds on our previous table with over 30% more elements. 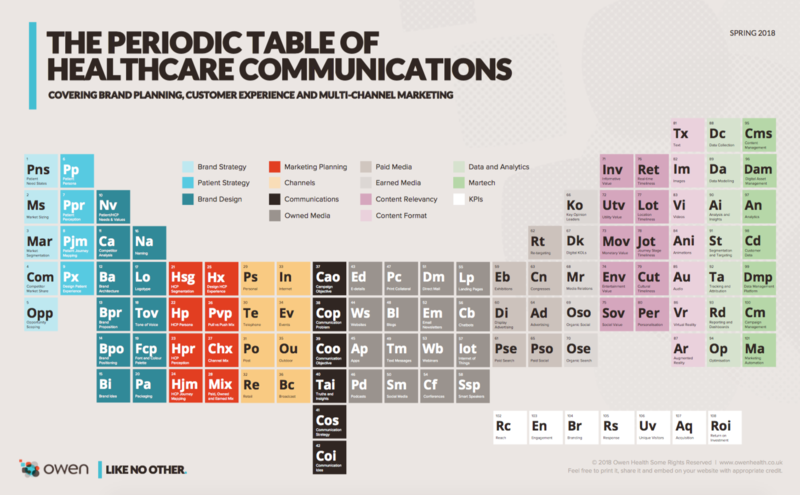 Feel free to download a high-quality version of the Periodic Table of Healthcare Communications from Slideshare here. We had lots of feedback from pharma marketing folk who wanted to know how pharma brand planning integrated with multi-channel marketing activities. As you’ll see, the brand activity, which looks at the market, patient and competitors, all takes place upfront and sets the scene for the marketing planning which finally informs the multi-channel communication campaigns. With customer experience becoming such a hot topic within healthcare we thought it was important to help pharma brand marketers understand where CX fits into healthcare communications. First, patient and HCP journey experiences should be considered at different points in the process and second, mapping a journey is a discreet exercise to designing a journey. With a new product launch, it can sometimes be too easy to combine the brand proposition with the communications proposition. It’s so important to keep these two propositions separate as they have different roles within healthcare communications, as you can see in our table. From helping pharma brands get their strategic thinking straight through to cost-effective design and production of collateral and content, we’re ready to help. Download your high-quality version of the Periodic Table of Healthcare Communications from Slideshare here. Liked this post? Please share it to help others find it. We are Owen Health, a healthcare communications agency like no other.